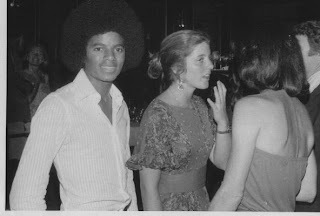 "When I first met Michael Jackson at a New Jersey amusement park this unassuming sweet kid was so humble that I thought he was the boyfriend of the gal who played Alice in The Wiz on Broadway. When he told me sweetly and without rancour "I am not her boyfriend." I later learned he was playing the role of The Scarecrow for The Wiz Movie and he was part of The Jackson Five. A few months later, he approached me and asked me to photograph him with Caroline Kennedy and her Mom, Jackie O. I told him it wasn't a good picture and I would ask them to pose with him. He declined shyly and assured me that the photo I took was fine. Years later Jackie had approached him when she was working for Doubleday for a book she wanted to edit about his life story (MJ's autobiography--- Moonwalk). At this time at the Rainbow Room she may not have been aware of his existence."